Grab it now as part of the anniversary sale. Shadow Warrior 2 is free on GOG for the next 48 hours, so go grab it from the homepage. Since Flying Wild Hog's game only came out in 2016, that's a pretty phenomenal get. The four-player co-op shooter was selected by GOG's community as the giveaway game to mark the service's 10th anniversary, in which we have selected a bunch of classics to pick up at a great discount. If you're wondering how we picked those, I chose them all from a big spreadsheet, and couldn't bring myself to narrow down the choices. That's why our selection is gigantic. 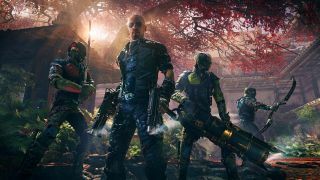 Here's what James Davenport said about Shadow Warrior 2 in his review back in the crazy days of 2016: "No matter how repetitive the environments and loot-tinkering get, Shadow Warrior 2 stays a rewarding slapstick comedy thanks to its thrilling open-ended combat. It’s like the FPS embodiment of a dive bar, a place to kick back and tear up some demonic bad guy fodder with some friends." You can also grab the game straight from its product page. Shadow Warrior 2 beat out Superhot and Firewatch as the free game of choice.